Feel Good Contacts absolutely love saving you money, whether it’s on your lenses, solutions, eye care products or designer sunglasses. And, if you share those savings with a friend, you can save even more money on future orders! 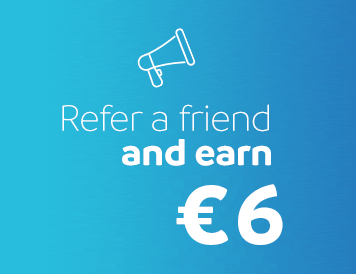 Refer a Friend to Feel Good Contacts today and you’ll earn 12,000 Reward Points, which is equivalent to €6 off your next purchase. We’ll also welcome your friend with a helpful 10% discount on their first order. You can refer as many friends as you like, meaning there’s no limit to how many reward points you can earn! After logging into ‘My Account’, click on the Refer a Friend tab. Make sure your billing address is not the same as your recommended friend's address. Your unique ‘Refer a Friend’ code will be revealed. This code can be shared on social media platforms, or you can use the built-in form to email the code directly to your friend. Your friend will need to enter your unique code at the checkout when they’re placing their order to receive their 10% discount. Your account will then be credited with 12,000 Feel Good Reward Points.